The authors report on an amperometric method for the determination of glycoprotein by using an aptamer as the bioreceptor. The detection scheme is making use of aggregated citrate-capped silver nanoparticles (AgNPs) on a gold electrode. Aggregation is accomplished by addition of 4-mercaptophenylboronic acid (MPBA) which acts as a cross-linker due to the formation of Ag-S bonds and of boronate esters. A thiolated DNA aptamer was then attached to the electrode in order to capture glycoprotein. Once captured, the glycoprotein reacts with MPBA through the formation of boronate esters. The electrochemical signal is thus amplified by the formation of a network of AgNPs which act as redox reporters. To demonstrate the feasibility of the method, prostate specific antigen (PSA) was chosen as a model analyte. The detection limit for PSA is as low as 0.2 pg mL−1. In our preception, this method provides a powerful tool for studying the glycan function in biological and physiological processes. Schematic of the electrochemical method for the detection of glycoprotein. 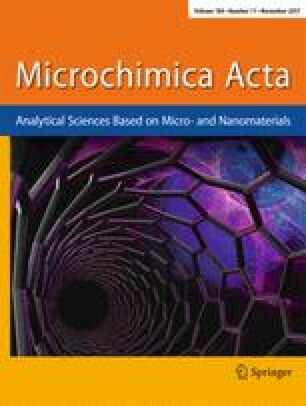 It is based on 4-mercaptophenylboronic acid (MPBA)-induced in situ formation of citrate-capped silver nanoparticle (AgNP) aggregates as the redox reporters. The MPBA molecules act as the cross-linkers of AgNP assembly based on the formation of Ag-S bonds and on boronate ester covalent interactions. The online version of this article ( https://doi.org/10.1007/s00604-017-2488-5) contains supplementary material, which is available to authorized users. We acknowledge financial support of the National Natural Science Foundation of China (21205003, 21305004), the Joint Fund for Fostering Talents of National Natural Science Foundation of China and Henan Province (U1304205), the Program for Science and Technology Innovation Talents at the University of Henan Province (18HASTIT005) and the Science & Technology Foundation of Henan Province (17A150001).